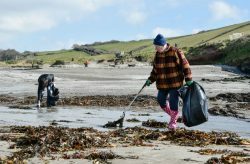 THERE are two pieces of litter for every footstep you take on a beach, and once again the National Trust is appealing for volunteers to take part in The Great British Spring Clean, run by Keep Britain Tidy, running until 23rd April. The tide of litter on our beaches appears to be on the increase, quantities of litter on UK beaches have more than doubled since 1994, and plastic now accounts for over 70% of all litter. Not only can litter be a health hazard to us and off putting to tourists, it is estimated that more than 100,000 marine animals die every year from entanglement or ingestion of items discarded on our beaches or at sea. The Great British Spring Clean hopes to inspire 500,000 people of all ages and abilities to join forces and collect and safely dispose of litter from our streets, parks and beaches, recycling as much as possible.